Abandoned as a child and fostered around a foreign city, Nikolay Somov had little hope of a successful life. Then he was wrongly convicted of a heinous crime and all hope was dashed. 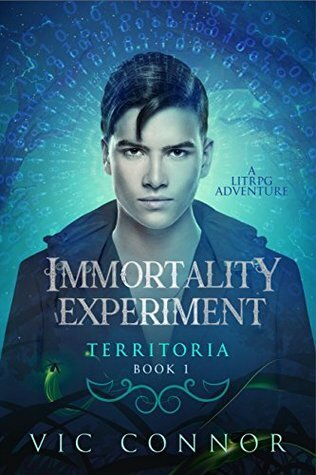 Imprisoned and awaiting execution, Nikolay receives an offer: Go on a mission inside the secret, government-controlled virtual world known as Territoria or die. Within the virtual world, Nikolay enrolls in the mysterious Ravenscroft Academy alongside humans, ogres, faeries, and gargoyles. As he continues to explore his new home, Nikolay discovers a conspiracy wrought with inhumane actions, driven by his captors’ boundless lust for power. What he thought was a school for the gifted turns out to be something else altogether. Surrounded by avatars, under constant surveillance, and fearing his mind has been infiltrated, Nikolay must escape or never see the real world again. This is the second edition of “Ravenscroft Conspiracy,” revised and rewritten with the input from readers. I was very intrigued when Vic Connor approached me to review Immortality Experiment. If you have read my About Me page, then you know I am a gamer and play WoW/Sims 4. So for me to imagine a virtual world where you are part of the game isn’t a stretch. I was very eager to read it to see if it met up with what I thought a total immersion virtual reality world would be like. Let’s say that I wasn’t disappointed. Immortality Experiment was a great read. Like I said above, I had no problem imagining what a total immersion virtual reality world would be like. Territoria lived up to what I imagined. Niko’s storyline did pull at my heartstrings. I did question how a teenager in the foster care system ended up on death row for murdering parents. Parents who disappeared years before. But, thinking about it now, Mr. Clark had something to do with it. The other storyline with Okapi Okonjo was at the same time chilling and sad. Yes, I am feeling sympathy for a man who did horrendous things in the game. The reason why he did such awful things are explained and that is what turned my sympathy on. No one should have to go through that (read the book if you want to find out). I liked Niko. He had such a hard time growing up. I mean, who wouldn’t when your parents disappear, leaving you to the mercy of the foster care system? I know I wouldn’t have grown up thinking life was all sunshine and roses. Nope, I would have grown up like Niko did. I could understand Niko’s acceptance of Mr. Clark’s offer. It was either go to Territoria or die. If I had to make the choice, I would have made the same choice as Niko. I loved seeing Territoria for the first time with Niko. All the different races (people’s avatars) were fascinating to read about. I liked the idea of Ravenscroft Academy. A school for kids who have high IQs that focuses on their education. The more that I read about Ravenscroft, the more it became clear that there was something going on there. I mean, they sealed off the 5th floor, if that gives you any clue. Also, there is a thing called The Hunt which reminded me of The Purge to an extent. The bad guys weren’t bad guys in the book. Yes, Mr. Clark was asking Niko to do something horrible to his parents but the reasons were valid. Okapi Okonjo also had some valid reasons for being an awful guy in Territoria. I am not defending them by any means. I am saying that I can understand why they did what they did. The end of the book ended on a cliffhanger. I would be all “I hate cliffhangers” and list all the reasons why I hate them. But in this book, it works. The ending makes you wonder what’s next. That is why I will be reading book 2. I have to find out how Niko progresses with his quest. Immortality Experiment is a fast-paced young adult novel that will keep you glued to the pages. I found this book a refreshing change from the young adult novels that I have read lately. I would recommend this book to anyone over the age of 16 and anyone who likes fantasy.